It has been a busy couple of weeks around our household lately. School started for both of my kids and I’m happy to report that they are really loving it. Honestly, getting back onto the swing of things wasn’t that difficult despite the transition from late summer bedtimes and laid-back mornings around the house. And I suddenly have a bit more free time now, which has fallen perfectly in-line with canning season! That wonderful time of the year when I dream of tomatoes. I’ve been busy in the kitchen stocking up on salsa, sauces, and plain tomatoes for the winter. Two more boxes I picked up from the farmers market this weekend are waiting for me as I write this. But, I wanted to share this ridiculously delicious recipe with you before I dive into chopping my day away again. 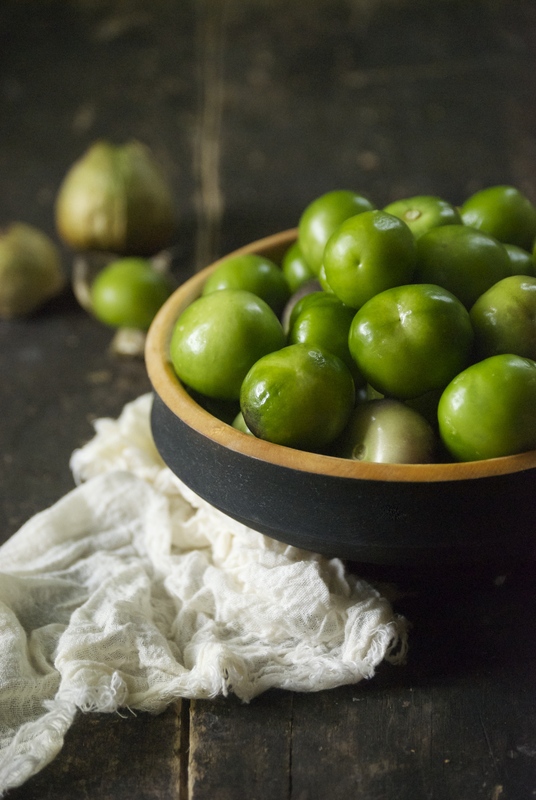 I was never exposed to tomatillos while growing up. In fact, I didn’t really ever buy them before I moved to Minnesota. 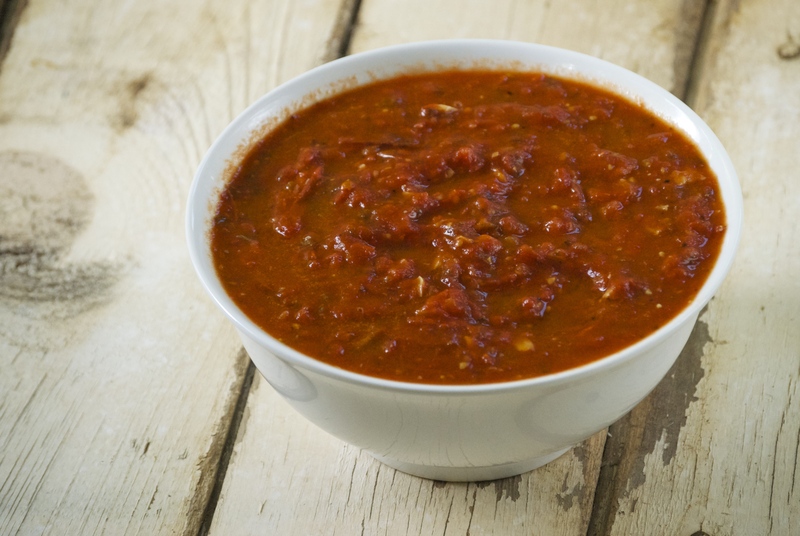 Now, I just love them and making salsa with them is a no-brainer. However, we’ve been getting a beautiful bag almost weekly from our CSA, so I wanted to do something a bit different, because how many chips can a girl really eat? Kidding…I can eat A LOT of chips. 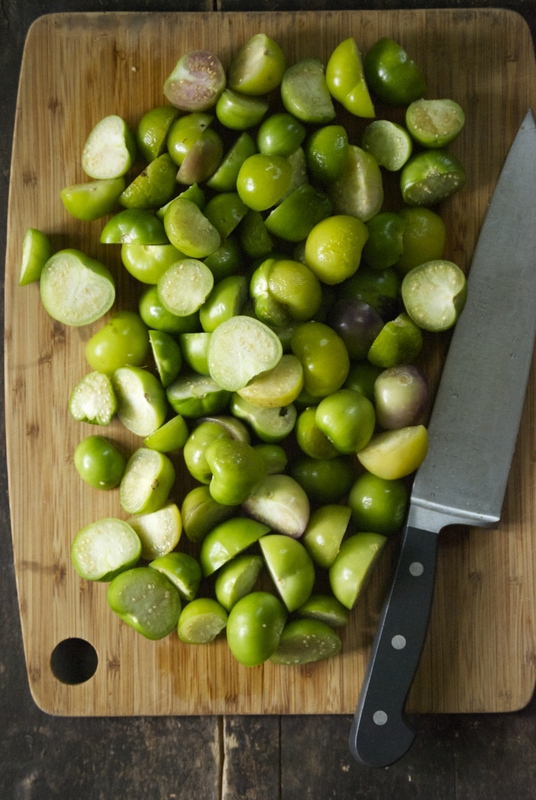 Pork and tomatillos are a perfect combination together– the tang from these little green gems is perfect. This stew could not be easier to make or more satisfying. 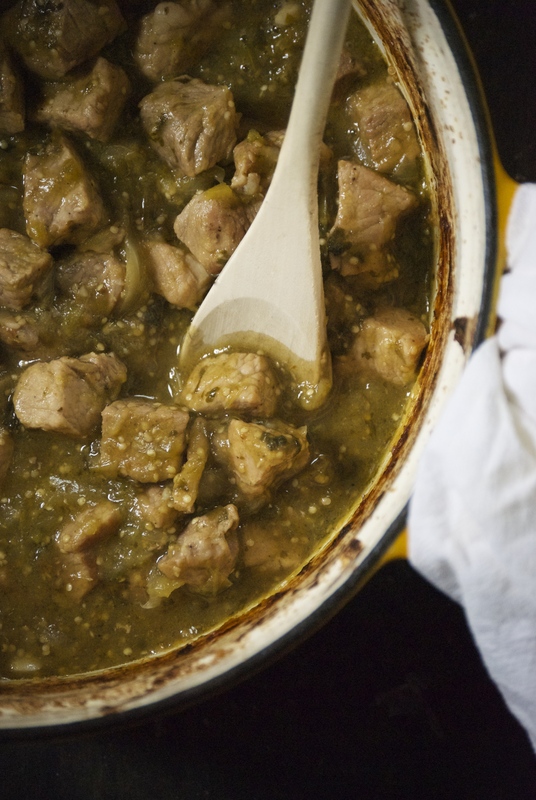 The flavors are bright and the pork is tender, yet doesn’t need to cook all day long, which makes it a bonus for a weeknight meal. I love to serve it with a scoop of brown rice on top, but it can be equally satisfying if you prefer it without grains. 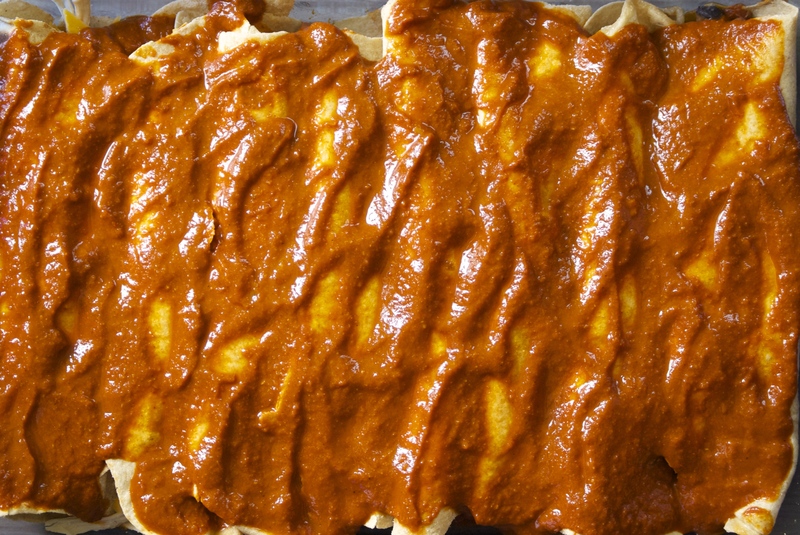 If your family loves heat, preparing it with jalapeños in the sauce would be ideal. We put them on the side, because…kids. 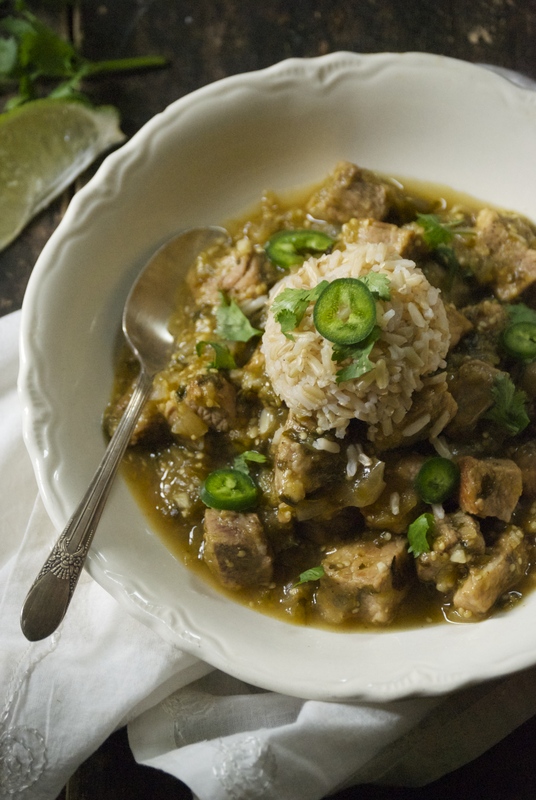 I really hope you make this stew– it’s perfect with the changing weather. Now, if you’ll excuse me– I need to get back to my little tomato factory. Hope you are all well! Preheat oven to 400°F. Line a large baking sheet with parchment paper. 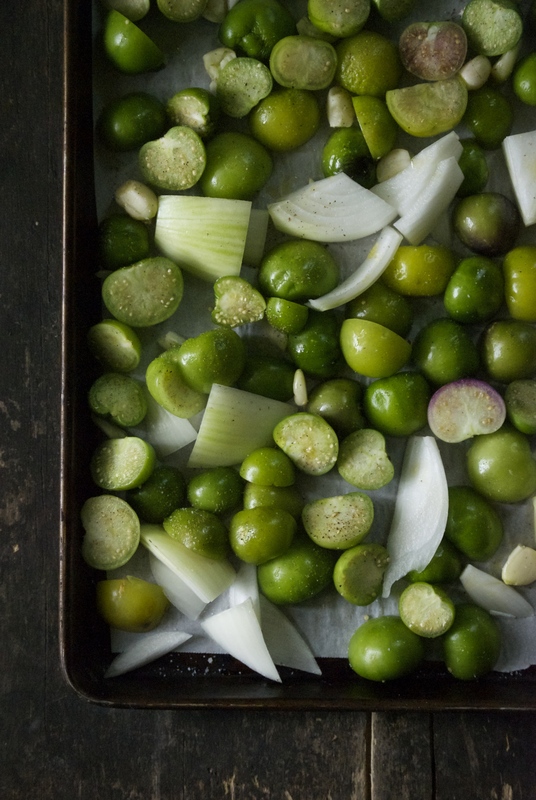 Place the tomatillos, onion chunks, and garlic cloves on the baking sheet. Drizzle with olive oil and sprinkle with salt and pepper. Roast for 30 minutes, then broil for 2-5 minutes until slightly browned. Keep a watchful eye. Meanwhile, heat a large Dutch oven over medium-high heat with about 2 tablespoons of olive oil. Sprinkle the pork shoulder with salt and pepper and begin browning the meat in two batches, so as to not to overcrowd the pan. When meat is done place it all back into the Dutch oven. Reduce oven temperature to 375°F. 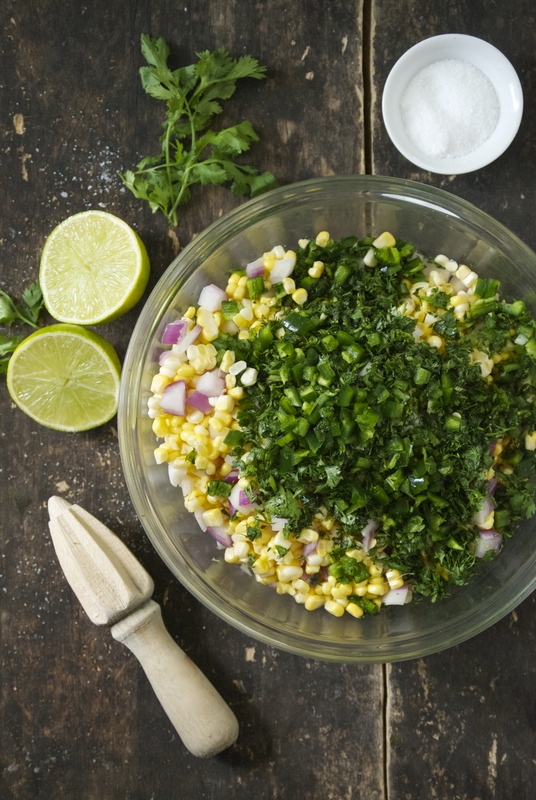 In a large food processor, place the contents of the roasting pan, plus 1/2 bunch of fresh cilantro, and ground cumin seed and pulse a few times. 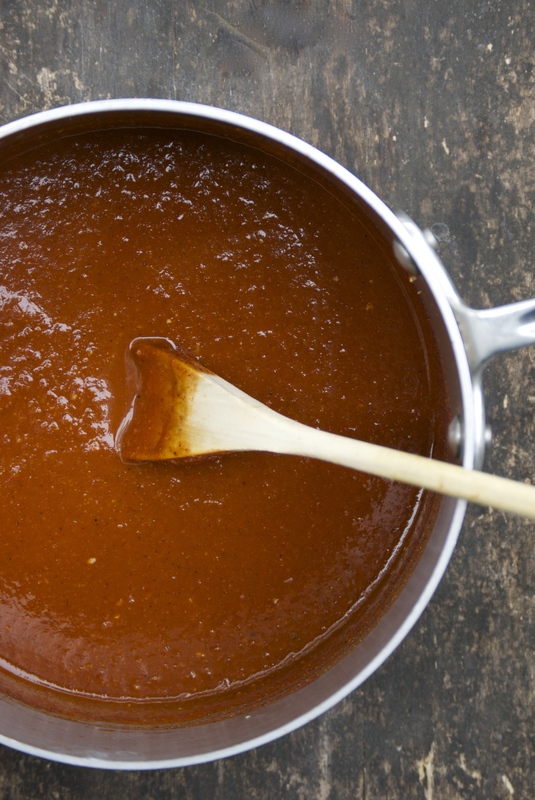 You don’t want the mixture to be completely pureed– a little texture is nice. Add the mixture to the browned pork. Stir. Bring almost to a boil on the stovetop then immediately place in the oven. Bake for about 1 hour, or until the pork is tender. Reseason with salt and pepper, if necessary. 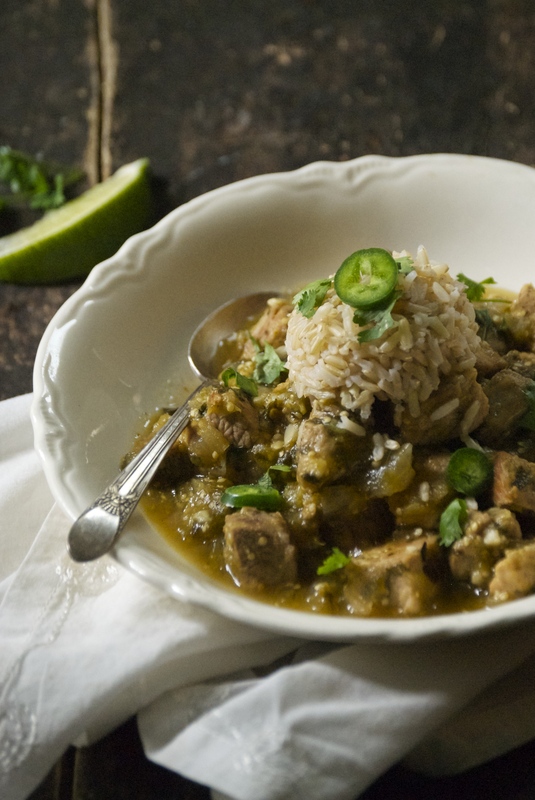 Serve immediately with a scoop of rice, jalapeño, more fresh cilantro and a wedge of lime. Enjoy! I finally did the thing that’s been weighing on my mind for the last year. I turned 40 years old on Tuesday. My apprehension wasn’t about the number itself, or the accumulation of tiny wrinkles gathering under my eyes– it was heavier than that. Those are superficial things that I can live with. Instead, my dread has been a bit more existential. Knowing that other inevitable changes are coming, like my children growing up, my parents aging, and that my limited time here is diminished with each passing year. Those are the things that are harder to accept. But now that 40 has arrived, I’ve decided to do my best and be optimistic. I’ll focus on the positives instead of dwelling on future loss. I’m surrounded by wonderful friends, and have been lucky enough to be born and married into two incredible families. I get to spend every day with my best friend and love of 23 years, and we have two sweet children. I’ve been fortunate with my health. Right now, things are good by pretty much any standard. I’m a lucky, lucky gal and I know it (and don’t think for one second that I didn’t knock on my wooden desk as I wrote that sentence). I’ve also decided to tackle new challenges. My kids are at an age that I now have more time to pursue my own interests. I’m ready to learn new things. I want to take up pottery, learn to play the guitar and violin, to knit, and to read more. I want to become more patient. Mostly, I want to consciously be in the present, rather than always waiting for some vague future to just “happen”. I also want to continue to learn new and exciting things about food and photography– this is the stuff that thrills me. Preparing the food, taking photos, and writing this blog make me very happy. I love connecting with all of you. With that little essay out of the way, there’s really no subtle segue into a recipe post, so I’ll just throw it out there– today I made simple, roasted smashed potatoes. They’re kind of a hard one to name, but hopefully the photos help you out a bit. These little gems are all about texture, texture, texture! Soft and pillowy on the inside and perfectly crispy on the outside. I love to pick them up and snack on them, but they also pair well with a burger or steak. Throw any herbs you fancy on them, but I particularly love the rosemary/preserved lemon combination. So, so good! Enjoy these potatoes over the weekend and thanks for listening to me ramble. Preheat oven to 400°F. Line a large baking sheet with parchment paper. Set aside. 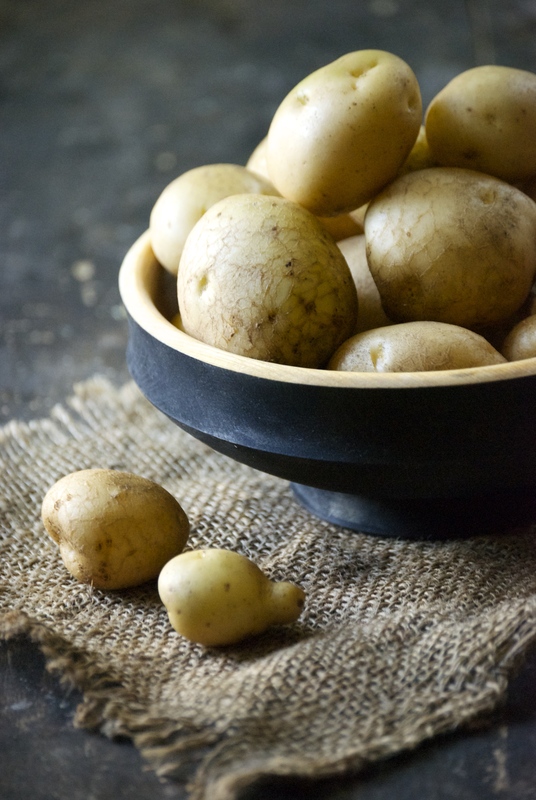 Begin by steaming the potatoes until they feel done when a knife is inserted into them– about 15-20 minutes (depending upon how big your potatoes are). Remove from heat and continue to let sit in covered pan just to be certain they are fully cooked. Dry the potatoes off if any water remains on them. Then place them on the prepared baking sheet and gently smash them down with a fork. You don’t want the potato to completely fall apart, but you do want some of the inside to be exposed– that way more crevices can become crisped. 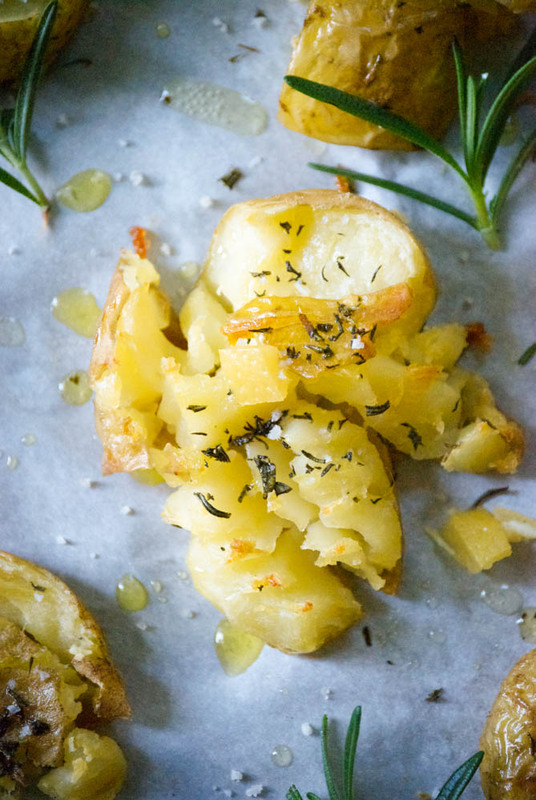 Drizzle a few glugs of olive oil over the potatoes, then the chopped rosemary, salt, and pepper. Roast for about 20-25 minutes, or until they have become a beautiful golden brown (check the bottoms, too). 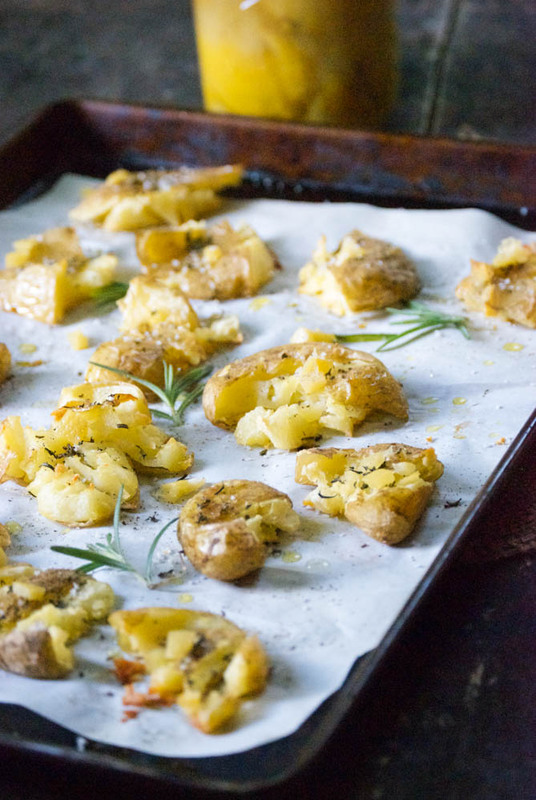 Remove from oven and top with more olive oil, more rosemary, preserved lemon, and salt and pepper to taste. Enjoy! One of my favorite summer meals is panzanella. 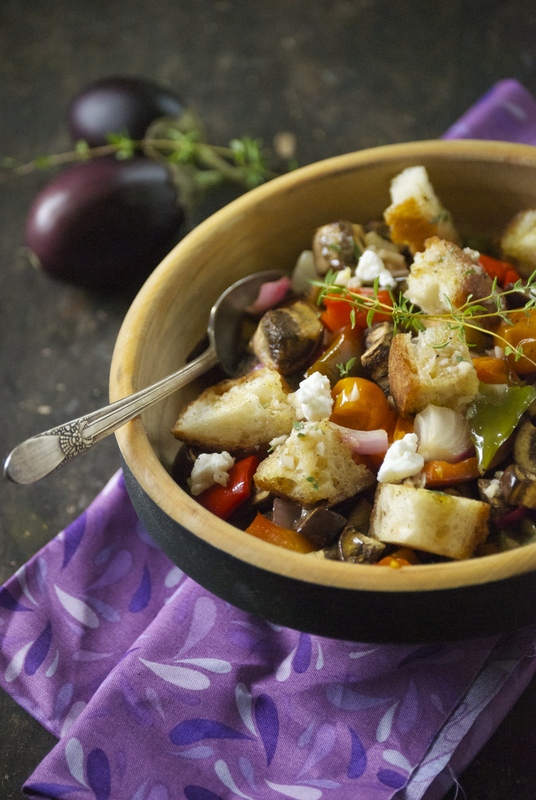 If you’re not familiar with this little dish, it is simply a bowlful of seasonal vegetables with homemade croutons or bread and a dressing of some sort. And it is wonderful. This fresh version with tomatoes and peppers is one that I make frequently. Today I wanted to create something just as pleasing, but a bit different. I wanted to be both delicious and satisfying as well as be loaded with vegetables. I know I’ve preached this before, but eating vegetables is key to keeping me feeling good, so I really try to pack them in throughout the day. One of the vegetables that I wanted to rely on for this receipe is eggplant. Why eggplant? Well, because I can’t stop buying it at the farmers market– it’s just so darn gorgeous. I have a weird relationship with this vegetable. I don’t generally love the flavor, and at times I find the texture to be a bit…unique. I needed to find a way to appreciate it, aside from the aesthetic, because admiring its beauty while it sits unused on my countertop is a bit wasteful. And the other recipes I’ve tried have just seemed ho-hum or so loaded with other unhealthy things that it kind of defeated the point of eating healthy. 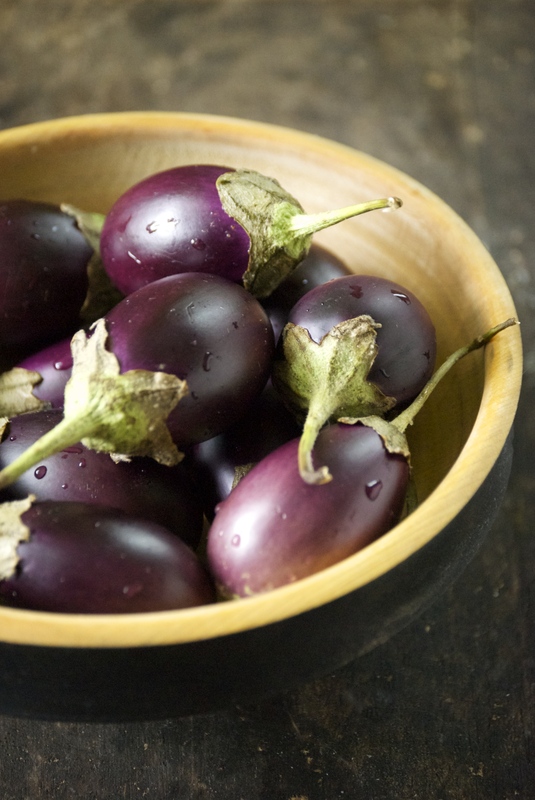 So that’s why eggplant. Thankfully, not only did I find a way to use it, I found a way to actually enjoy it! This panzanella is everything that I wanted it to be. Using small globe-like eggplants worked well in this recipe. The seeds are smaller, which appeals to me. The vegetables became tender and delicious when roasted. Tossing them with homemade croutons, a red wine vinaigrette, and feta was a beautiful combination. 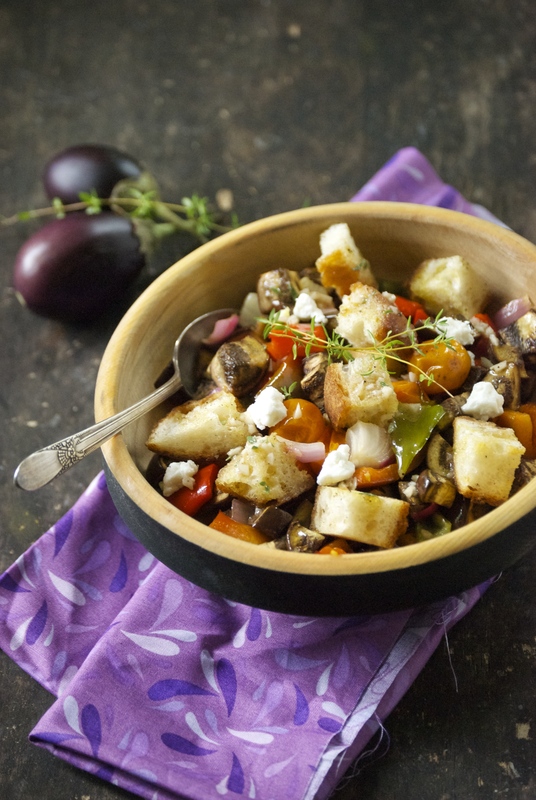 The feta melted slightly against the warm vegetables. It was magical. The smashed garlic cloves become soft and buttery. Roast whatever vegetables you have on hand– it will work. Change up the cheese, if you want. Goat or ricotta salata will work well, too. Enjoy! Preheat the oven to 375°F. 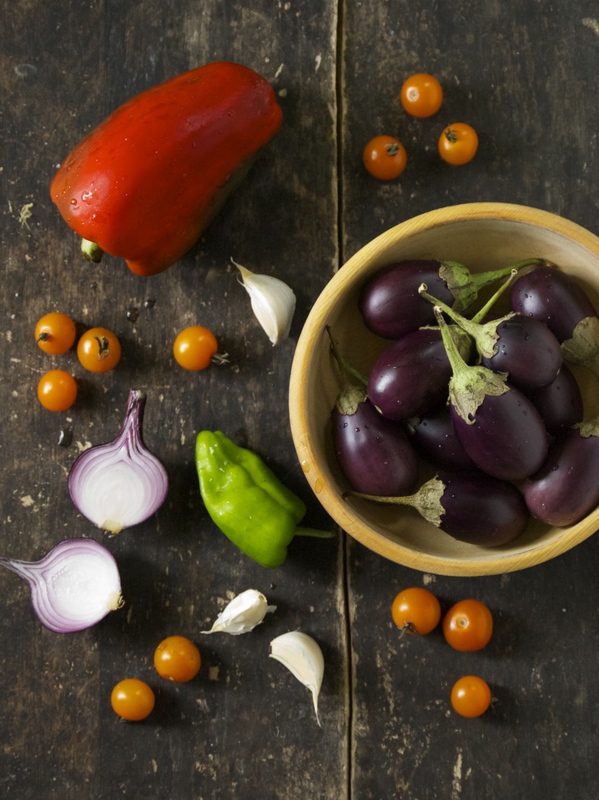 On a large baking sheet with parchment paper, toss the eggplant, peppers, onions, tomatoes, and garlic cloves together with 1-2 tablespoons of olive oil and a sprinkle of salt and pepper. Roast for 20-25 minutes, or until the vegetables are tender. Meanwhile, toss the cubed baguette with 1-2 tablespoons of olive oil and spread on another baking sheet. Sprinkle with salt and pepper and bake on the bottom rack until just crispy, about 10 minutes. Remove from oven. Make the vinaigrette by mixing the garlic clove, mustard, thyme leaves, and red wine vinegar together. Then whisk in the olive oil. Season with salt and pepper. 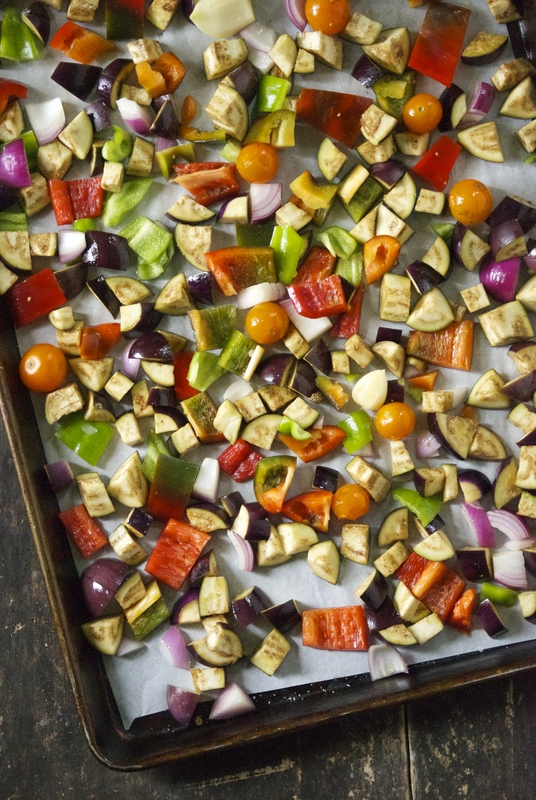 When the vegetables are done roasting, mix them together with the homemade croutons. Then toss everything with the red wine vinaigrette. Re-season with salt and pepper, if necessary. 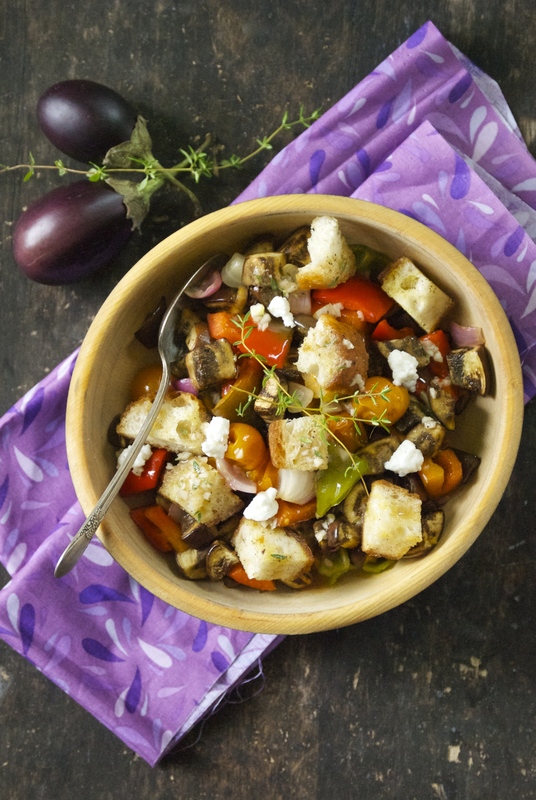 Serve with feta crumbles on top and even a few more thyme leaves. Enjoy! I’ll get to the corn salsa in a minute– but first I want to talk about beer! Admittedly, I’ve been drinking too darn much beer this summer. Not at one time– nothing like that. But this summer, more than any other, it’s just been so easy to sit outside with Radd in the evening and visit over a beer or two. I suppose it’s partly to do with our mild weather– not too hot, not too humid. It has been perfect, which is excellent for my happiness. And while I probably don’t need those calories at the end of the day, instead of stressing, I’ve decided to embrace it. So what have I been sipping on? Mostly farmhouse ales and saisons. Two that I love are Saison Dupont and a local farmhouse ale from Liftbridge called Farm Girl. Speaking of local beer, I’ve also been enjoying a few others like Bent Paddle’s Paddle Break Blonde and Steel Toe’s Size 7 IPA. Now before this post turns into an essay on local beer, let me just say this– our craft beer scene here in Minnesota is just incredible right now. So many wonderful breweries and taprooms, and I’ve been testing them out like it’s my job. I’m owning it, I don’t mind saying. 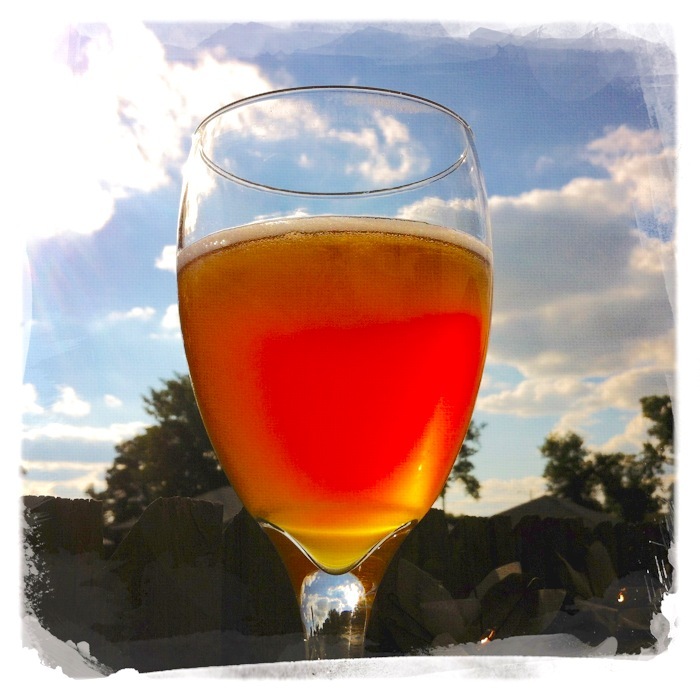 A few other great summer favorites (not local) are Leffe Blonde and Pyramid’s Apricot Ale. There, that’s my beer confession. So what goes smashingly well with summer beer? 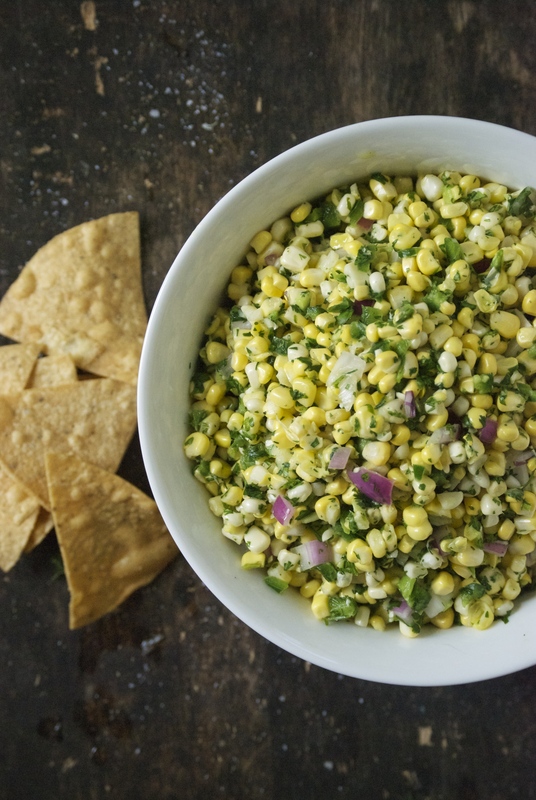 Yup– chips and fresh corn salsa. 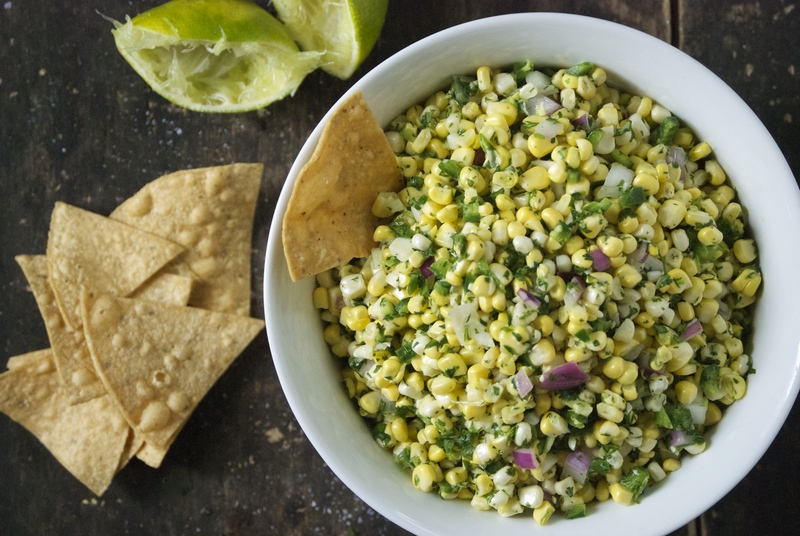 I love salsa of any variety– tomato, tomatillo… but, there’s something about fresh corn salsa that wins the salsa competition for me. I would choose corn every time. It’s fresh, slightly sweet, spicy, and loaded with that citrusy lime/cilantro flavor. Not to mention, it is simple to make– so simple that it’s somewhat silly to even give a recipe. But, I think the same can be said for most summer fare– fresh and simple and that’s just fine. 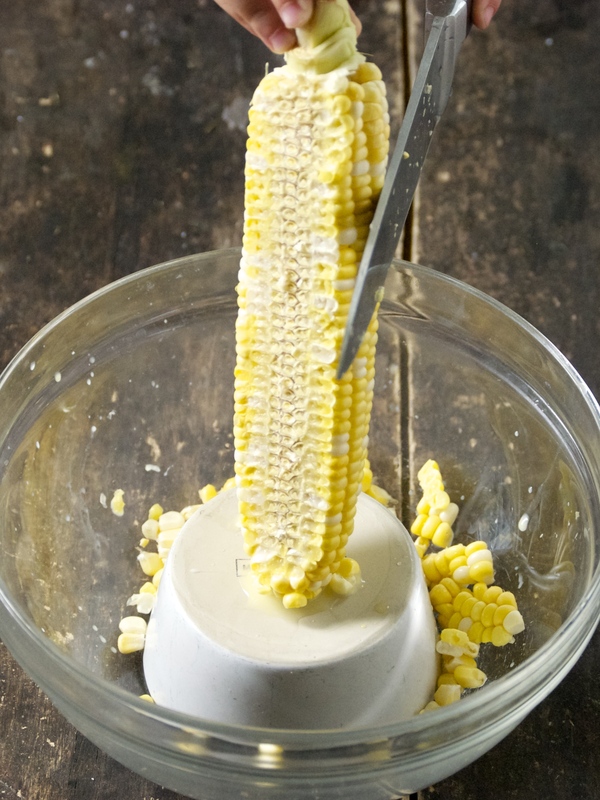 So, get out your chefs knife and start cutting up that corn. Then pour yourself a glass of cold beer and soak up some summer fun. Cheers! In a medium-sized bowl mix all of the ingredients. Add more lime juice to taste. Season appropriately with salt. 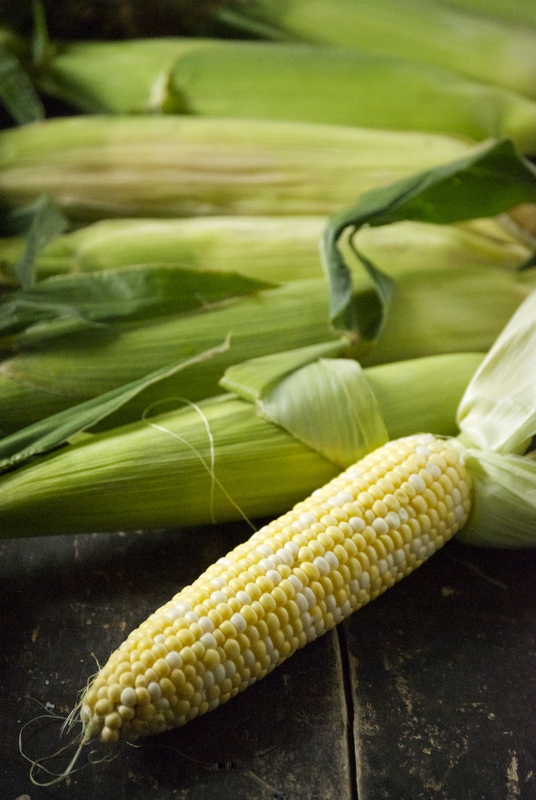 You may need more salt than you are used to — corn needs a bit to bring out its wonderful flavor. Let flavors meld for a bit before serving. Store leftovers covered in the refrigerator. Enjoy! You know what’s awesome? Handing your daughter a pickle and having her proclaim (without knowing where it was from) “This is amazin’!”. That, my friends, is what I call winning. She didn’t see me make the first batch of refrigerator pickles this year, but she’s been helping me make every batch since. She is fascinated by the fact that it doesn’t take very long to transform a cucumber into a wonderful pickle. I decided to wing-it this year and make up my own pickle recipe. After waiting rather impatiently for my mom to send me her recipe (you’re in trouble, mother), I decided to conjure up my own version. 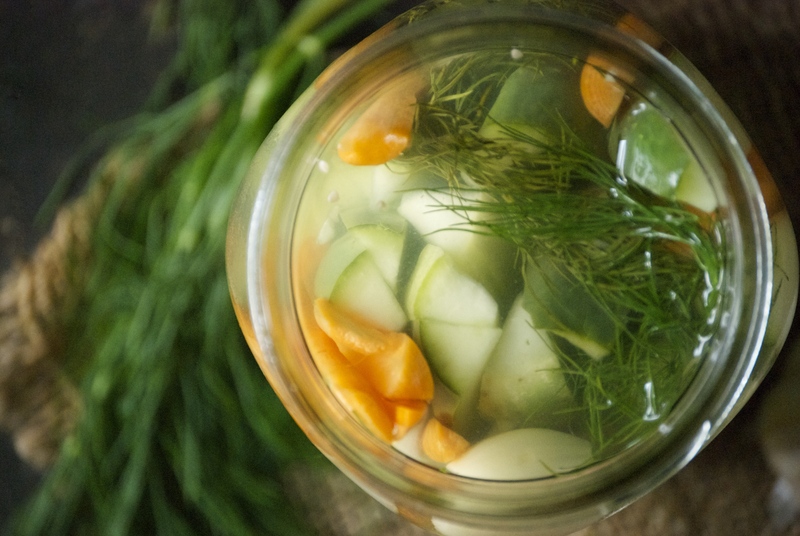 Sure, I’ve made lots of refrigerator pickles in the past, but nothing that kept me wanting to make the same batch again. I was reaching too far, to be honest– over-complicating things. I kept looking for something “interesting” that would blow me away. Last year I even tried a version with mint, and while they were fine, they just were not what I was looking for. I realized that what I was really after wasn’t complicated at all. I wanted something that was really crunchy, fresh, garlicy, and had a clean dill taste. Simple. Classic. So, I stopped searching and just made them the way I wanted. Duh. The key for me to keeping them refreshing is to lessen the salt and vinegar amount a bit. I remember this trick from my mom, which is why I probably loved her pickles so much. 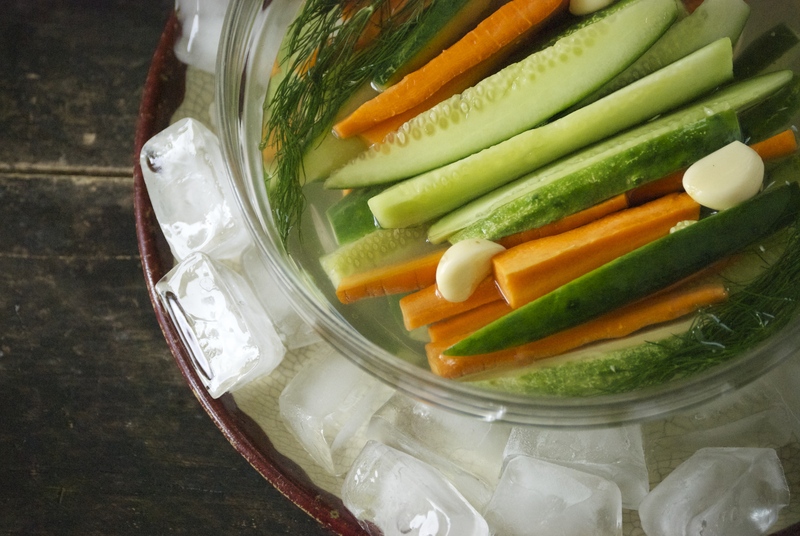 Add a little filtered water to the vinegar and it creates the most refreshing brine. Too much salt makes me want to stop eating something in a hurry, but just the right amount– and I can chomp on these babies all day long. 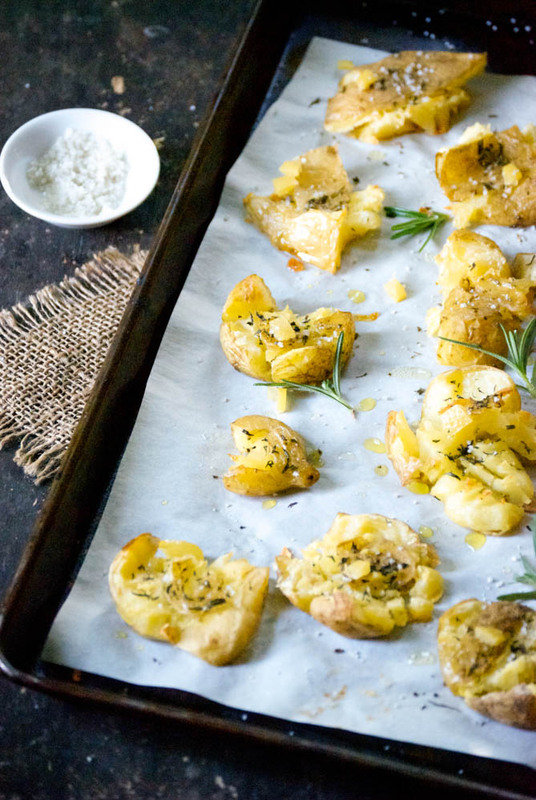 The dill and garlic are just what you’d expect them to be– delicious. No surprises here. 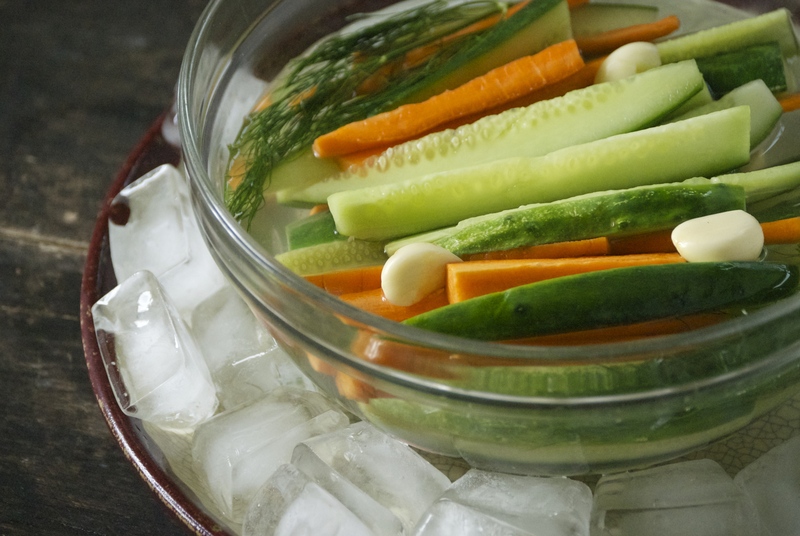 I always add carrots to my refrigerator dills– they’re fantastic. They take a bit longer to pickle than the cucumbers do. 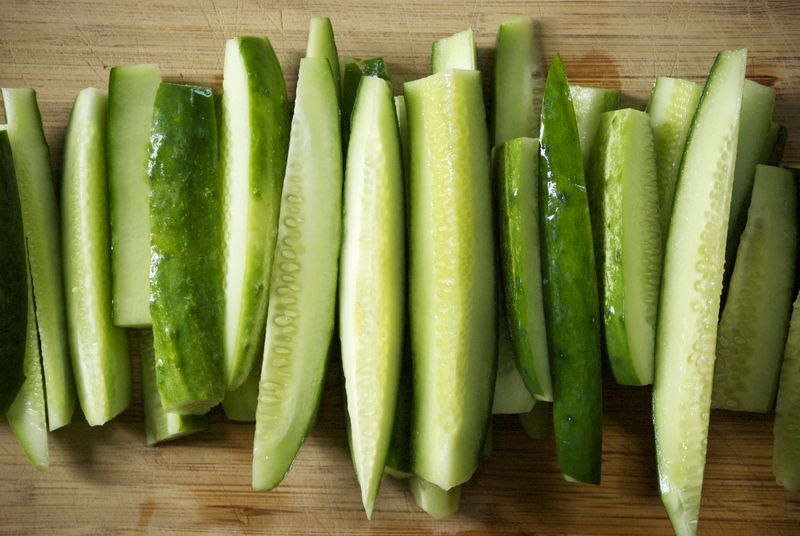 Using young small cucumbers is the key to a crunchy pickle, as is not heating up the brine mixture. Keep everything cold and you’ll have a fantastic crunch– I promise you. 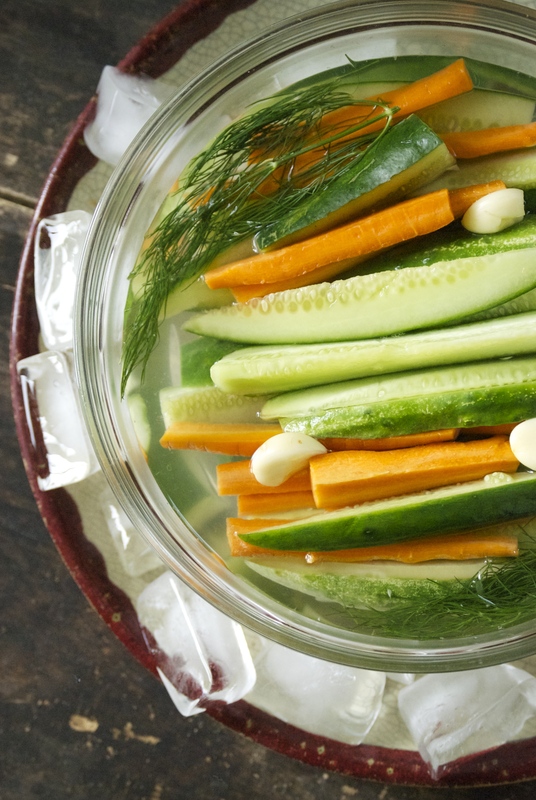 These pickles are perfect to bring to a barbecue or neighborhood gathering. Bring a huge bowl of them– they’ll disappear quickly. 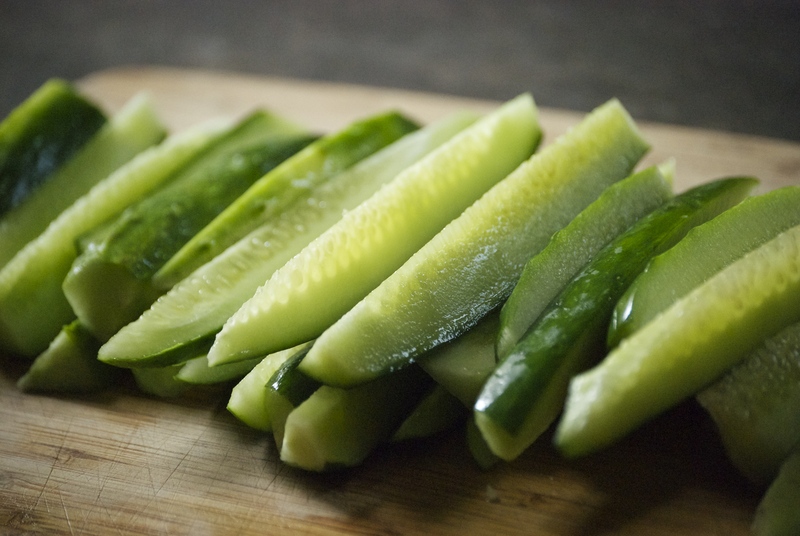 There is nothing better than sinking your teeth into a cold, crunchy pickle on a hot summer evening. National Night Out is next Tuesday in the US. I plan on bringing a big bowl of these crunchy dills, and I think you should do the same. Or just make a jar or two to keep in your refrigerator for when you need that tangy, satisfying crunch. Make as many jars as you want. 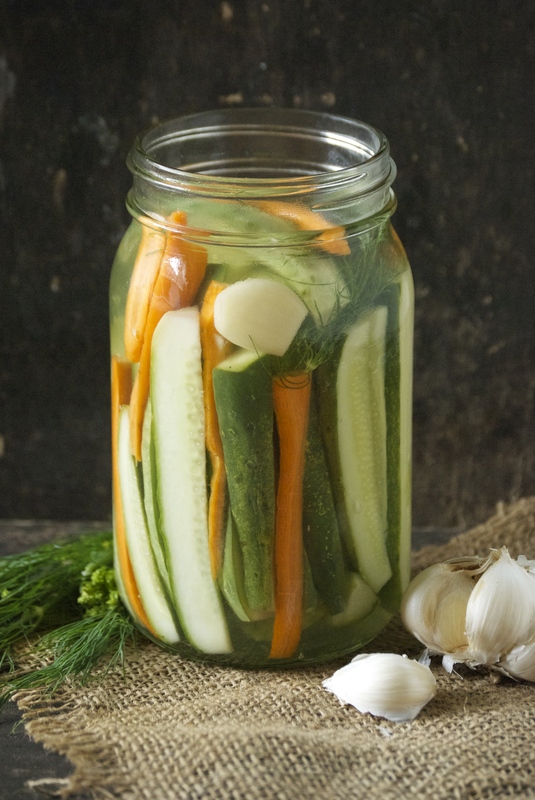 Fill each clean quart jar with cucumber spears, carrots, 3-4 cloves of garlic, and fresh dill. Make sure everything is packed in there tightly. Sprinkle with kosher salt. Pour vinegar into the jar until it is 3/4 full. Then finish filling the jar with filtered water, leaving about 1/2-inch space at the top. Cover with lid and gently shake to combine. Refrigerate. 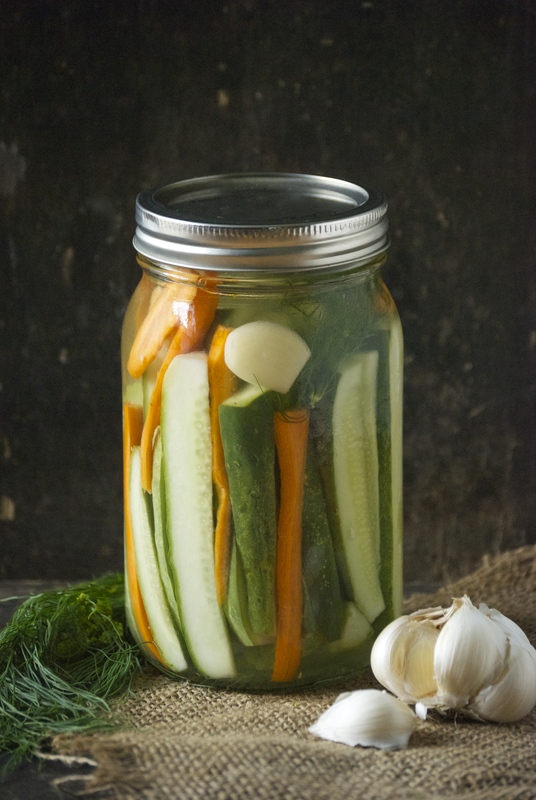 Pickles will be ready within a few hours, but it’s best to wait at least a day for optimum results. Carrots often take a bit longer to fully become pickled, but I generally eat them before the fact. Enjoy! The tomatoes have finally arrived here in Minnesota! Yes, that sentence deserves an exclamation point. It’s always a long wait for me throughout the year for these babies. I love tomatoes, but the sad store-bought versions just won’t do. So, I can or freeze as much as I can to make it through the winter, then patiently wait for them to appear at the farmers markets the next summer. Every year I somehow trick myself into thinking that they should appear earlier than they really do. Tomatoes need time and lots of sun. I have a few plants in my yard again this year that are coming along nicely, but the bulk of my preserving comes from the farmers markets, where I can buy bushel upon bushel of these little red gems. I’ve mentioned here before that I love to can salsa. I’ll be makes lots of batches of this recipe in the coming weeks. I also can plain tomatoes, and a couple different versions of tomato sauce. The version I’m sharing today is not a canned one–so, you can exhale now. It’s actually my favorite tomato sauce and I preserve it by freezing it. Super easy and ridiculously delicious. I love to can, as it’s a great way to preserve and we happen to have a large storage room in the basement, so it works well for our family. 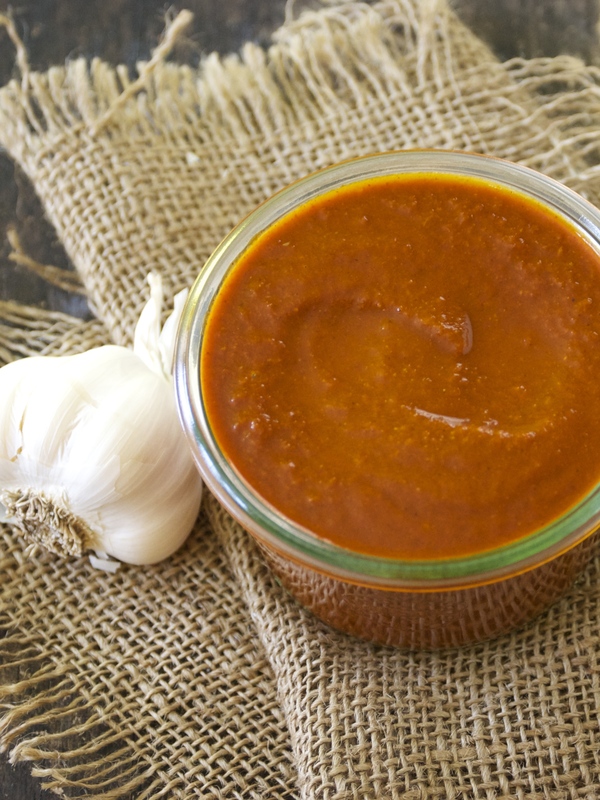 But, in all honesty, I love the taste of this un-canned sauce even more. The flavors are spot-on and lemon juice (which is used in canning to keep the ph levels safe) is not needed. 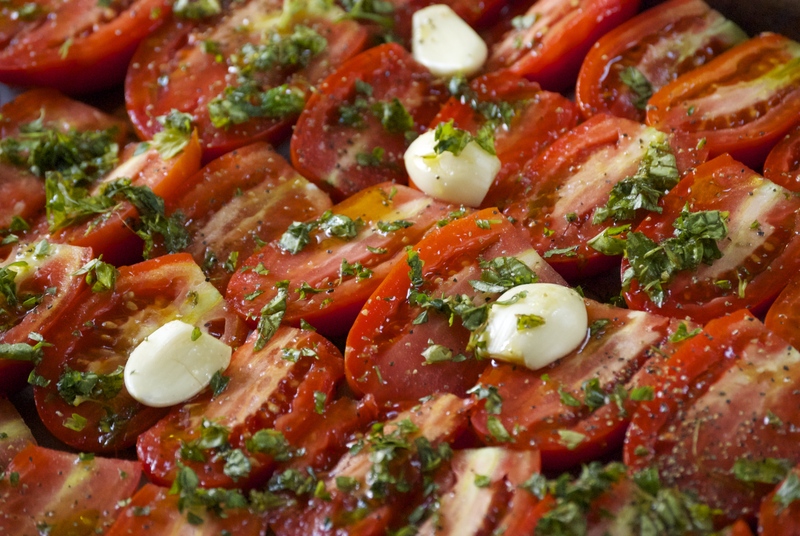 I use roma tomatoes here (they are wonderful for sauces) as they have a lower water content. Roasting tomatoes is one of my favorite ways to eat them. Something magical happens when that tomato caramelizes a bit. The flavor intensifies and I simply can’t stop popping them into my mouth. I love to pair them with some delicious cheese and crusty bread. Simple summer meals are the best. 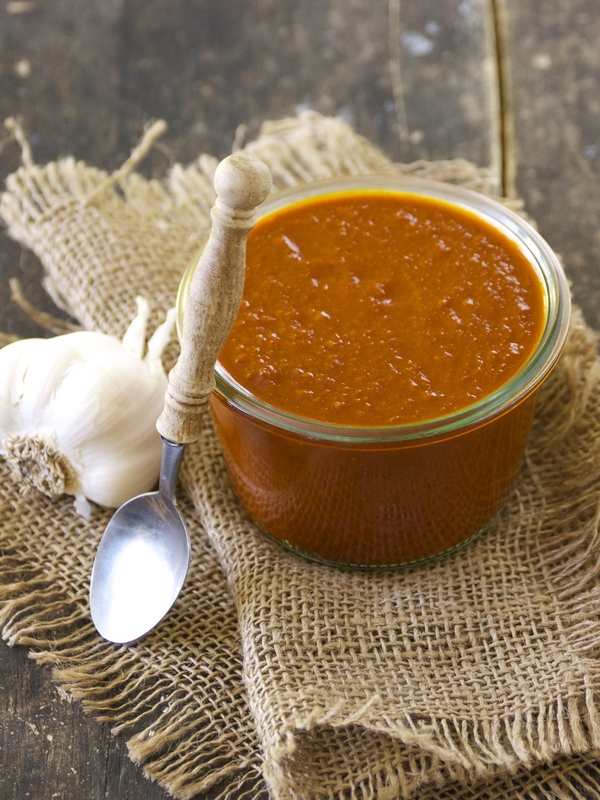 When we’ve eaten our fill, I put the rest of the tomatoes, garlic, and herbs into the food processor and give it a few pulses until it become this thick, fragrant tomato sauce that can be used in so many ways. At this point, I freeze the sauce, unless I want to use it in the next day or so. Freeze it in whatever you like– freezer bags or vacuum seal it in a special bag (freeze first, then vacuum seal it closed) are both methods that work well. I use this sauce all winter long and it is always a sad day when I pull the last one from the freezer. I hope you give this version a try. Enjoy! Preheat oven to 375°F. 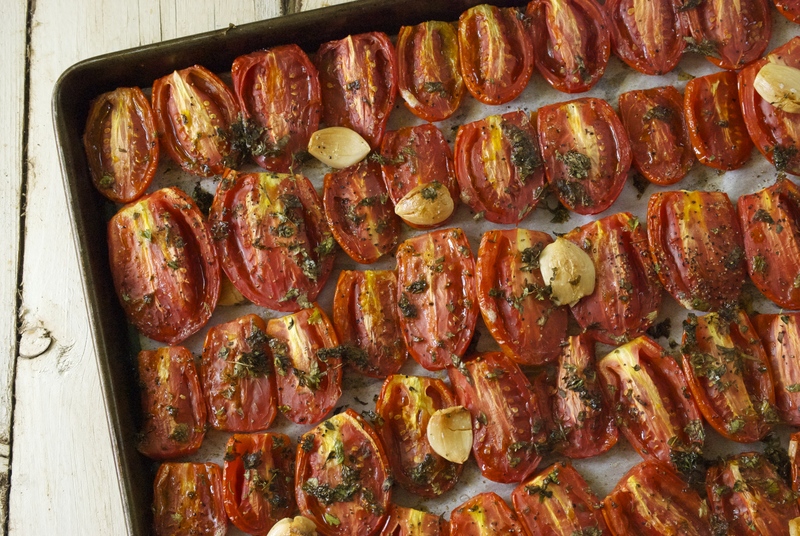 Line 1-2 large rimmed baking sheets with parchment paper (depending upon how many tomatoes you want to roast). 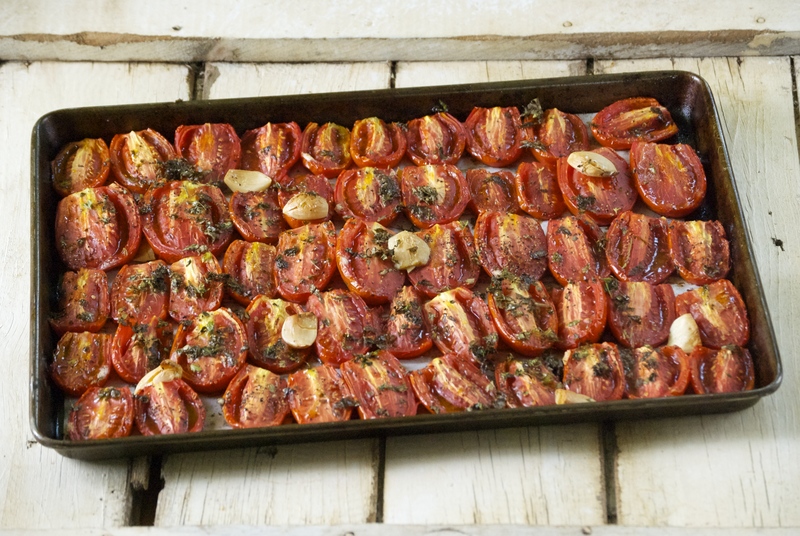 Fit the tomatoes snuggly, cut-side up, in a single-layer onto the pan, they will decrease in size as they cook. Drizzle with olive oil. Sprinkle with the chopped herbs, garlic, salt, and pepper. Roast for about 40-50 minutes (if using two pans, rotate them half-way through). Then increase temperature to 400°F and roast for at least another 10 minutes to caramelize the tomatoes, sometimes a bit longer. Check the bottom of them for a dark caramel color. Remove from oven when done. 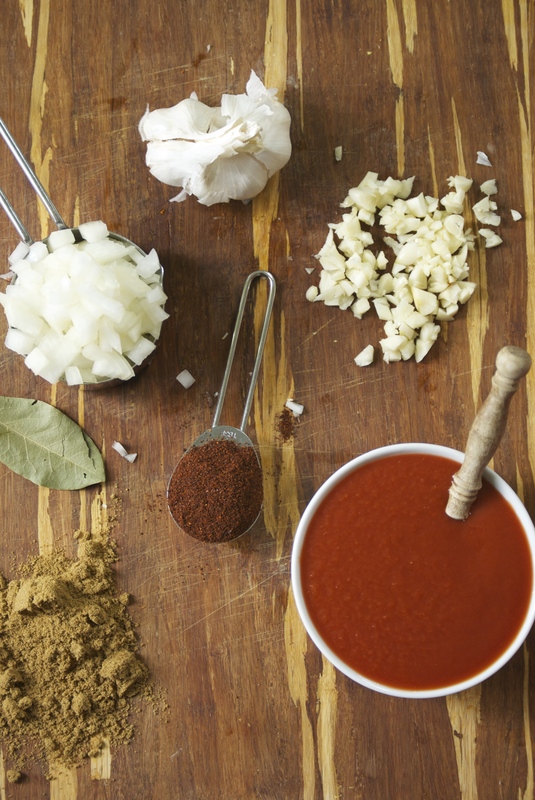 If wanting to make sauce, place all of the roasted ingredients into a food processor, juices too (or by hand). Pulse for a few times until mixed. Place in freezer bags or bags that can be vacuum sealed (freeze first, then seal), or any other container you want to store them in. Enjoy throughout the winter!